Roadrunner Records band The Amity Affliction have announced details of a new North American tour, which will see the band returning to the states for the first time since the release of their acclaimed new album, MISERY. 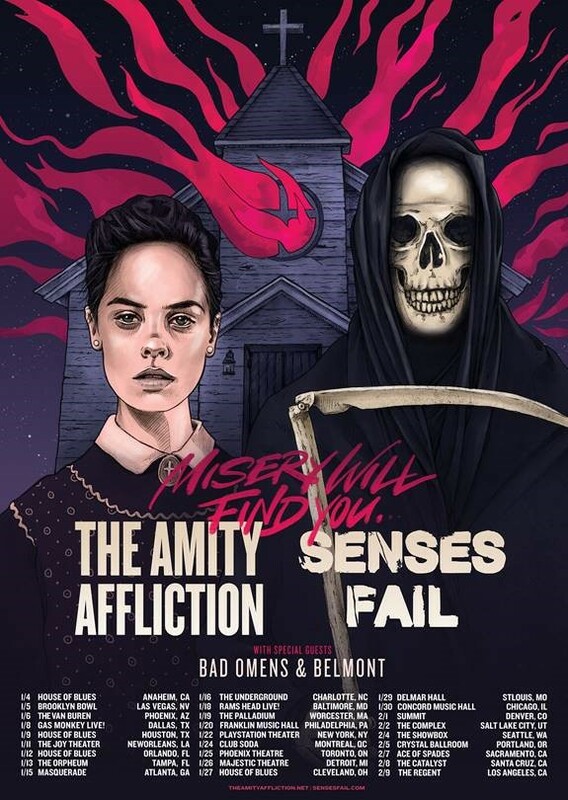 The “Misery Will Find You Tour” will find The Amity Affliction joining forces with Senses Fail, Bad Omens, and Belmont, with dates kicking off January 4th at Anaheim, CA’s House of Blues (see attached itinerary). VIP pre-sale tickets are available now with an additional Spotify pre-sale launching tomorrow, November 7th at 10:00 AM ET. General on sale tickets will be available to the public Friday, November 9th at 12:00 PM ET. For tickets and more information visit www.TheAmityAffliction.net or www.sensesfail.com.